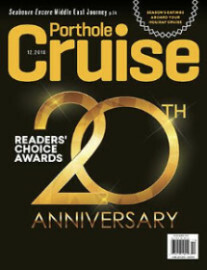 Porthole Cruise Magazine, the nation’s leading cruise travel magazine, is pleased to announce the winners of its 20th Annual Readers’ Choice Awards. The champions in 36 cruise-line categories and 15 destination categories were determined by thousands of ballots completed by the magazine’s readers and online fans who voted on their favorite cruise ships, favorite onboard amenities, and, for the first time ever, favorite cruise destinations. The complete list of Readers’ Choice Awards winners is published in the November/December 2018 issue of Porthole Cruise Magazine (on newsstands November 13) as well as online at Porthole.com/RCA2018.